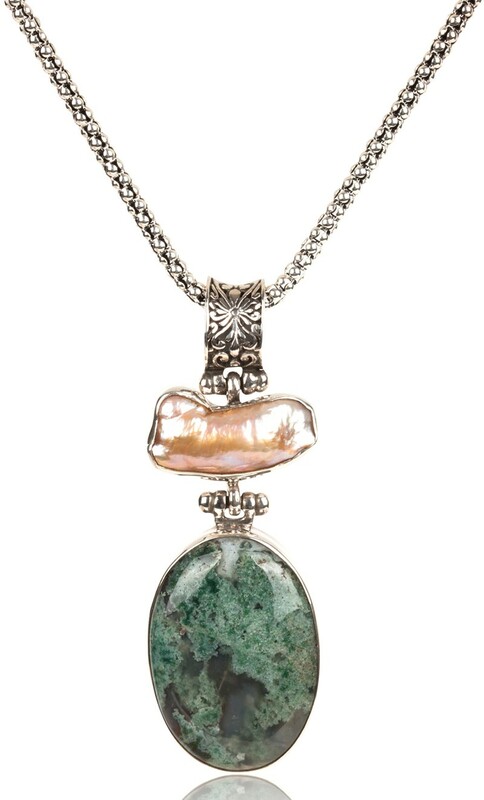 Moss Agate and Baroque Pearl Necklace | COLLECTIONS | Designed by Be.St. Natural moss agate (onyx) and baroque pearl necklace is designed and hand made by Designed by Be.St. The silver slots which surround the stones are created manually through a coating technique that needs a high level of skill and experience. Agate takes its name from the river Achates in Sicily. It is a member of Chalcedony family. It is called moss agate when it acquires a mossy appearance by the impact of different minerals. The most beautiful moss agates are found in India. Agate stones have soil as element, pelvic cavity as chakra and sun as a nerve net. Aries, Taurus, Gemini, Leo, Virgo and Sagittarius are its horoscopes. 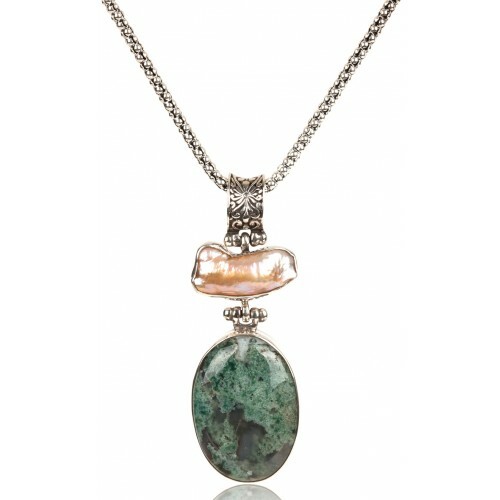 Moss agate symbolises earthly success, protects against negative energy, revitalises the exhausted courage, and gives a feeling of happiness when used as a jewel. Pearl, so-called the queen of stones is a precious one with feminine influences. Since ancient times, it is used for calming the mind and soul. The phrase Baroque pearl is thought to be originated from the Baroque Art School which is eminent in Europe from the middle of 16th until the end of 18th century. Baroque refers to those pearls grown in an amorphous shape in nature.